Why hello there, I'm a really cool dude. But do you know what makes me even cooler? KevinNol sure does! Without it, I'm uncool, but with it, I'm very cool! KevinNol is cool! *Do not take KevinNol if you plan on becoming lame within the next 12-20 weeks. Do not use KevinNol as bootleg Red Bull. KevinNol does not actually like you. KevinNol is your friend. The world is better with KevinNol. KevinNol is not bipolar, and don't you try and claim it is! Since KevinNol is a sugar pill, it will cure diabetes. 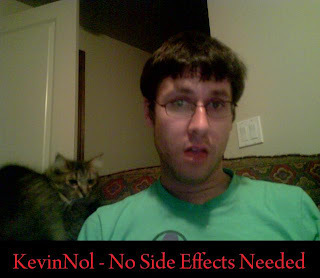 KevinNol isn't a placebo, but a world class panacea. KevinNol does not actually work. KevinNol is your friend. KevinNol tastes delicious, something akin to boxed mashed potatoes, but actually good tasting. Do not consume KevinNol if you are allergic to KevinNol. We cannot tell you what exactly goes into KevinNol, but we will confirm it may or may not have roofies in it. Do not consume KevinNol if you are allergic to roofies. *Under all the disclaimers for the disclaimers, you probably didn't realize it, but I've entered into the lucrative world of drug making. Wait, let me rephrase that... I've entered the amazing world of KevinNol. Many out there might think this endeavor just doesn't jive with me. But I do enjoy making money, and it seems like off-brand manufacture of potentially dangerous chemicals in a setting akin to a mid-level meth lab has always appealed to me. But as with any startup, I've encountered my fair share of problems. The biggest one is all I've really done is thinking up a bitching name. Oh, a bitching name and a list of frightening, yet totally plausible side effects. Certainly this is the exact same process Bob Ritalin went through when trying to name his wonder drug. Sure, I have a very weak chemical knowledge background (my B+ in the easy Freshman-level chemistry notwithstanding) but like any drug manufacturer, I can make up stuff that sounds horrifically awful but include the vague promise of maybe doing something adequately and all will be forgiven. The copays will then rain down from the heavens, and I will be free to roll around in said copays—naked. It might seem kind of uncool to laugh at all of the lower class people who don't have my Scrooge McDuck level of riches. But, did I mention I'd be doing it while on KevinNol? *Please note, this will only make the dream come true for Mr. Kevin. But if you help support him, that makes you cool in his book.